By GreenEyedLillies on November 1st, 2008 . Filed under: Decorating, Gifts, Kitchen . Have your cake and eat it, too! 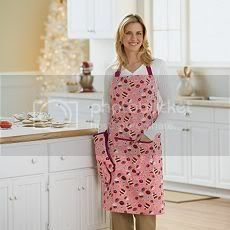 This fun apron and oven mitt set is fashionable and functional. In pink/multi. Cupcake, cake and cookie print offers a sweet look. Matching oven mitt protects you when carrying warm dishes. Adjustable neck loop and tie-back closure on the apron promise the perfect fit. Front pocket conveniently carries utensils. Cotton construction offers long-lasting use throughout the holidays. there’s all sorts of other cute cupcake things at kohls. gift sets with cupcake scented lotion and shower gel. a mitten, hat and glove set. and also some sleep pants. not to mention a kids apron set that comes with a cute cupcake hat! Oh noes there are no more! :( Sad day! i have a cupcake apron too! its blue with smaller cupcakes on it than those and i wear it every time i cook or bake! I found several fun cupcake ideas on the site listed above. Cupcake Placemats, Cupcake Oven Mitts and Cupcake Pockets to hold ipod. All are sewing patterns. I made cupcake placemats for my daughters birthday party, machine embroidered each guests name across the top and at the end of the party the children got to take them home…we also decorated cupcake and they got to take them home too. Thank you for all the great ideas and links! Hi there, I accidently come across your blog whilst hunting around the Internet as I am looking for some material on wall ovens!. It is an informative website so I’ve bookmarked this site and I will revisit you tomorrow to enjoy a more detailed read when I’ll more free time.